April 11, 2019 — In March, the median sales price of a home in Baltimore Metro reached the highest March price of the decade at $264,000, a 5.8% ($14,500) increase from last month. Year over year, townhouse prices were up 2.8% to $210,750, condo prices rose 2.2% to $205,000, and single-family homes increased 1.5% to $329,900. 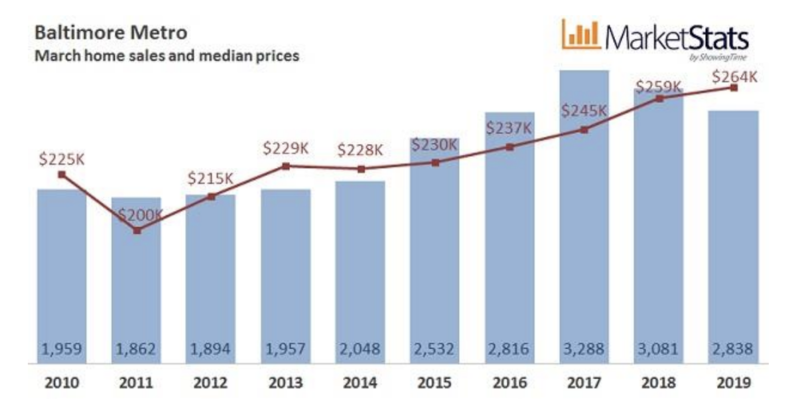 Prices in Baltimore Metro have generally risen since December 2015 and remain well above the five-year average of $247,085 and the ten-year average of $233,143. Prices are 32% higher than the March 2011 low of $200,000. At the same time, March marked the seventh consecutive month of declined closed sales. However, while year-over-year inventory has swelled over six consecutive months, levels remain below historic averages, putting upward pressure on prices. Howard County continues to boast the highest prices in the region with a March median sales price of $390,000. Anne Arundel County experienced the largest price gain in March (up 2.8% to $335,000). Baltimore City remains the most affordable area in the Baltimore Metro region with a March median sales price of $143,000, up .4% from March 2018. The Baltimore Metro area median sales price set a new March record, rising 1.9% to $264,000 compared to last year. Generally, prices have increased since December of 2015. Sales volume of nearly $850 million was down 6.5% from last year. With 2,838 closed sales, a decline of 7.9% compared to last year, year-over-year closed sales have now decreased for seven consecutive months. However, new pending sales of 4,410 rose by 4.5% compared to last year. New listings increased by 1.5% to 5,661, a rebound from the slight decline seen last month. The 8,593 active listings at the end of March were up slightly (+1.0%) from last year’s levels, but inventory levels remain well below historic averages, keeping upward pressure on prices. The March average percentage of original list price received at sale was 95.9%, a slight decline from last year’s 96.0%. Median days on market dropped to 47 from last year’s 52 days. The Baltimore Metro Area housing market includes the City of Baltimore, Anne Arundel County, Baltimore County, Carroll County, Harford County, and Howard County in Maryland.